You can never have too many fruit slots, right? Playson brings you yet another fruit machine inspired casino slots on the internet with simple gameplay and exciting wins with Phoenix Fire. Phoenix Fire is a classic fruit slot with 5 reels and 10 paylines that has an old-school feel and is bursting with colour. This slot has the typical features you'd find on a fruity and also features a flaming phoenix which has the potential to win you a fiery 679x your stake with every spin. Phoenix Fire is one of the best video slots online with a classic fruity theme designed by Playson. 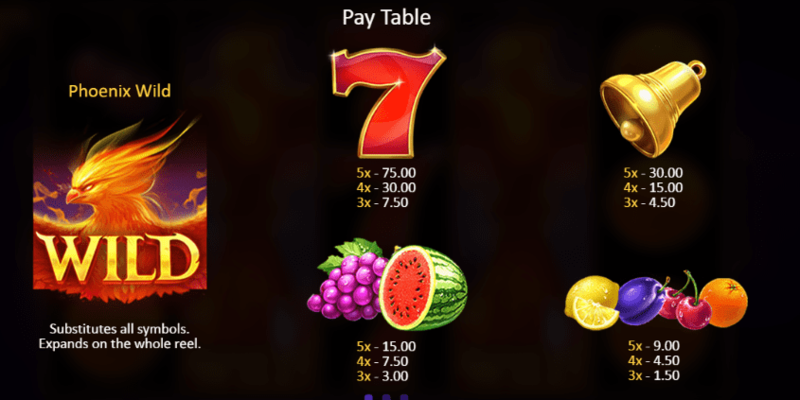 This slot has 5 reels, 10 paylines and is a fairly straightforward game to play (perfect for slot novices and fruit slot lovers). As you can imagine, Phoenix Fire is bursting with juicy colour and the design is very fruit inspired. Behind the reels, you'll see a plain purple background which makes the reels stand out. The symbols include a range of tasty fruits including a juicy watermelon, a bunch of red grapes, tangy oranges, sweet cherries, sour lemons and plums. Other symbols include lucky red 7's, a golden bell and a ferocious phoenix. Fruity Payouts - Landing 5 matching plums, lemons, cherries and oranges can award you with up to 3x your stake. Landing a row of grapes or melons can award you with up to 5x your stake, and landing a row of 5 golden bells can award you up to 10x your stake. Look out for the lucky 7's as these are the highest paying symbol and can award you with up to 25x your stake when you land 5 of them. 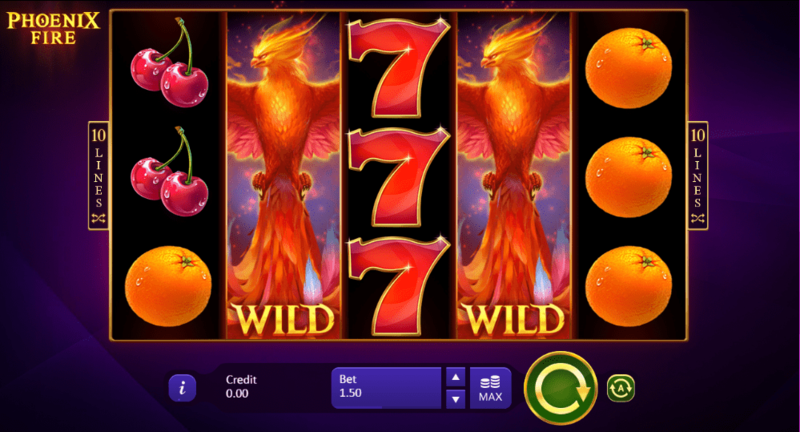 The Wild Symbol - The wild symbol in this slot is the phoenix. These fiery creatures can only land on the middle 3 reels and have the ability to turn the whole reel wild. Landing the phoenix also awards you with a re-spin which then expands and locks into place. Landing another phoenix symbol will lock that into place too. The phoenix is the best part of this slot as you can win a staggering 679x your stake with every spin.